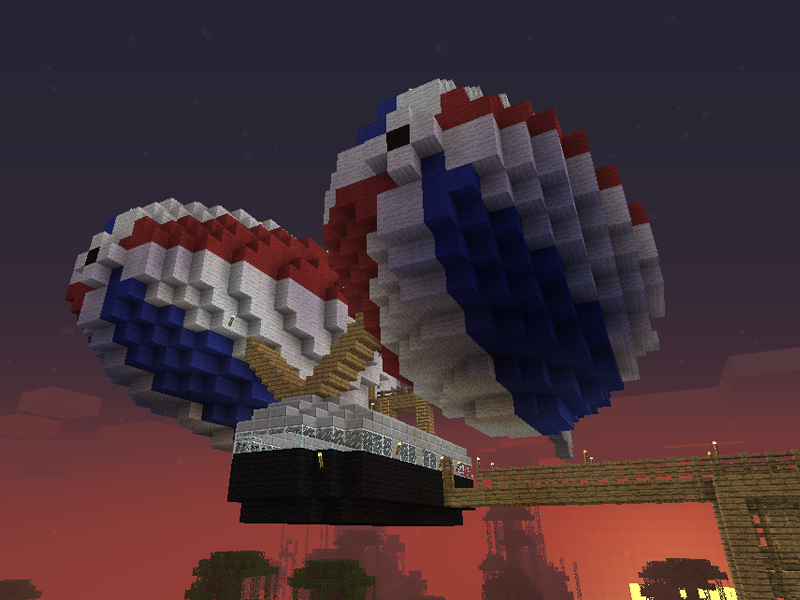 My third build on the new multi-player Minecraft server is another in the sky-bound vein. 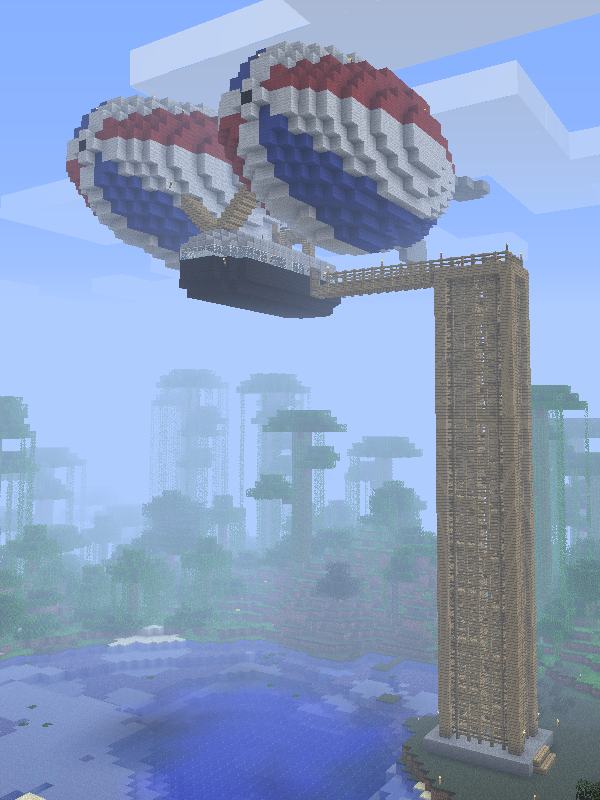 Having already built a hot-air balloon on the old server, I wanted to make something a little more grand. This time, I decided to try building an airship. I wanted to keep my few first builds together so the spot I picked for my airship is located behind the Clipper I’d constructed earlier, floating over the same ‘lake’ it is moored in. Building up means space isn’t really an issue but still, I didn’t want everything to look too cramped so the base of the build is off to the side, on a little outcrop. The first thing I needed to do was build a staircase to reach the airship. It had to be tall but not excessively so – I wanted to keep my sanity while constructing the thing plus it was just the starter and I was itching to move onto the main course. Despite that, the staircase required a large amount of fences (and, of course wooden stairs) so half a forest had to be sacrificed in order to build it. Don’t worry, I replant. Climbing the stairs to the top takes an age so I added a ladder to the centre of the structure to speed things up. Purists can still walk to the top of the staircase going round and round and round if they so desire… and have screw or two loose. The bottom of the staircase is quite simple with a plain stone base and a sign informing visitors that the airship tours have been suspended for the time being (there is a problem with the airship’s engines – turns out they’re made of wool). 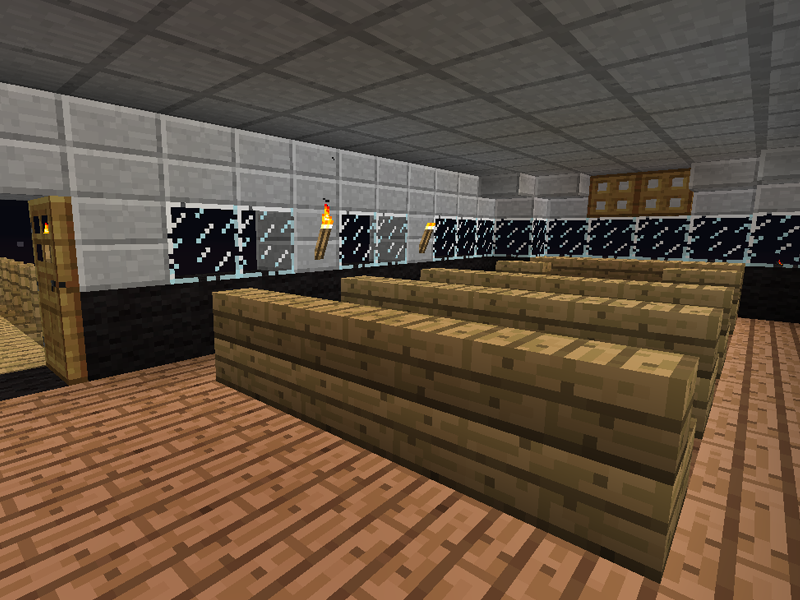 Once you reach the top of the staircase, and cross the gantry to the gondola itself, you’re presented with great views of the surrounding area and can relax on the oh-so-comfortable wooden-stairs-standing-in-for-seating that you see in so many ‘great’ Minecraft builds. What’s a few splinters in the backside between friends, eh? Don’t worry about the roof of the gondola being made entirely of stone slabs. The two woollen balloons it’s attached to manage to somehow keep all that weight afloat. The gondola has two exits – one that leads back to the gantry, the staircase and ground level and one that… doesn’t. Be sure to leave the gondola via the correct door. In case you’re unsure, the wrong door has a helpful sign to warn you that the first step is a doozy. Luckily, what with the airship being temporarily moored over a lake for these repairs, even if you do make a mistake, your landing will not be fatal. It will however be rather damp. Hmm, maybe someone should lock that door. At the back of the gondola are a pair of ladders that lead to the roof and allow access to the balloons themselves. As with all large structures, you save a hell of a lot of wool by making the things hollow and so a pair of doors lead to the their interiors. I haven’t built anything in there but they’re both pretty roomy and would make for great little bases of operations (or just a really excessive amount of storage). 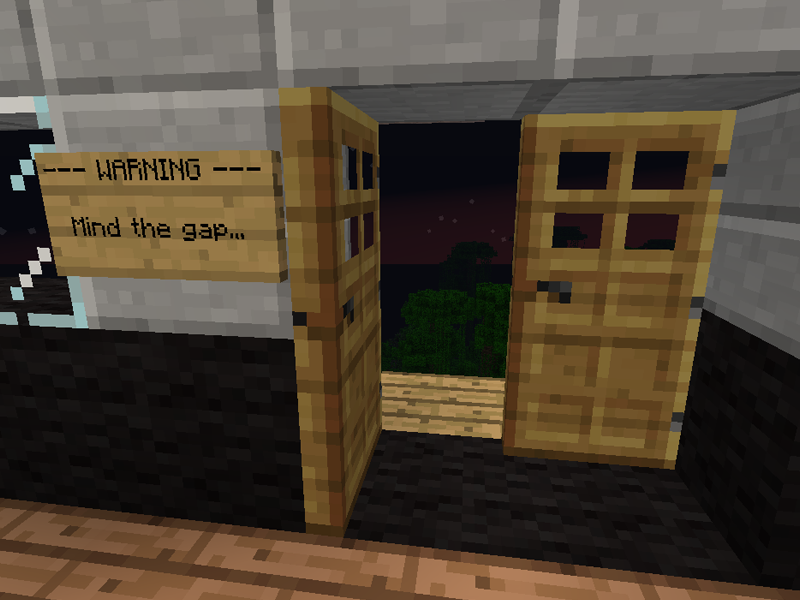 I enjoy building structures in Minecraft that defy gravity in some way or other. 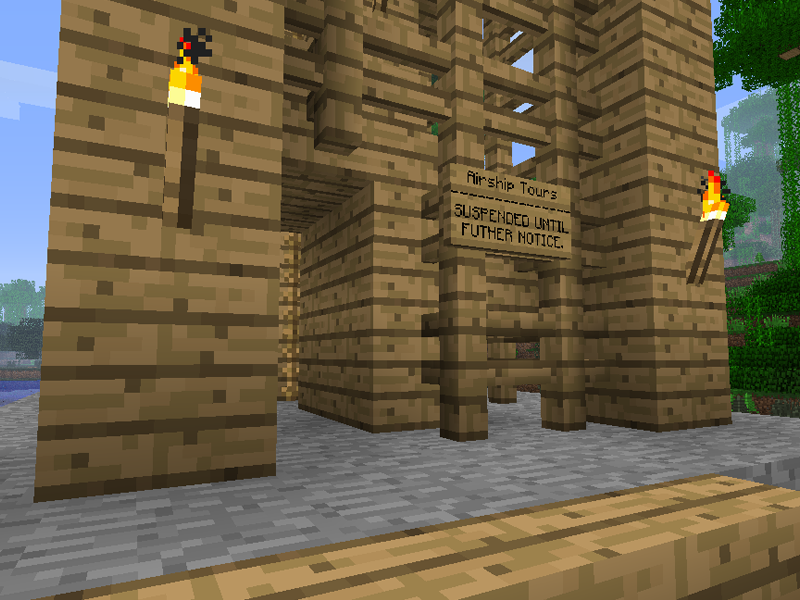 With the build height limit of the game being increased by another 128 blocks recently, there’s an awful lot of real-estate to claim up there so it’s daft not to take advantage. I won’t be building any pointless 180-ish block tall towers any time soon but these minor outings into the sky make me happy. Update: A schematic of the Airship is available to download. Check out this post for more details.